White chocolate is a wonderful vehicle for vanilla. Good quality white chocolate is made up of cocoa butter, sugar, milk solids and vanilla, so most good white chocolate will already have a distinct vanilla flavor and it doesn’t take much more to push that to an even better one. So that means that this White Chocolate Vanilla Bean Tart is a good choice for vanilla lovers, as well as for anyone who is a white chocolate fan. 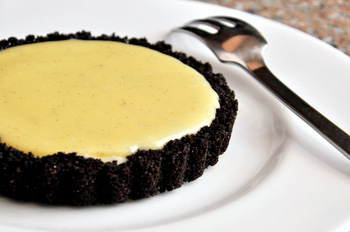 The tart has a chocolate crumb crust and is filled with a decadent vanilla bean-infused white chocolate ganache. 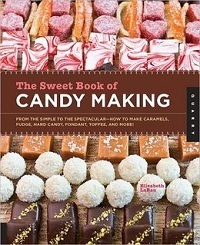 The ganache is made with just three ingredients: white chocolate, heavy cream and a vanilla bean. The cream is heated and infused with vanilla, then poured over the white chocolate to create the ganache. It is silky smooth with a beautiful vanilla and cream flavor that reminds me a lot of vanilla bean ice cream. The chocolate crust is made with plain chocolate wafer cookies that have a strong cocoa flavor to them. 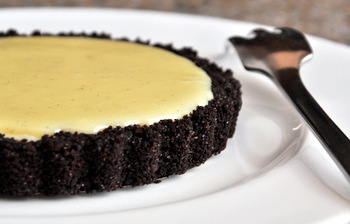 As a result, the crust is not very sweet at all, so it tempers the sweetness of the ganache and adds a crunchy texture to each bite of the tart. Be sure to use high quality white chocolate, not anything labeled as “baking pieces” or “candy coating.” These faux white chocolates aren’t made with cocoa butter and won’t give you the silky texture that we want in this tart. They also tend to be extremely sweet. I used Callebaut white chocolate in my tart and can assure you that it is worth splurging on some premium chocolate as a base for this recipe. If you don’t have individual tart shells, or simply want a larger dessert, this recipe can be prepared in a 9-inch tart shell instead of four individual shells. This recipe can also easily be halved to serve make just two tarts. When I halve the filling, I often make all four tart shells anyway and just tuck two away (in an airtight container) for a few days for later use, as it is nice to have a tart shell or two on hand. Preheat oven to 350F. Take out four 4-inch tart pans. Make the chocolate crumb crust: Mix together chocolate cookie crumbs, sugar and salt and stir to combine. Pour over melted butter and stir with a fork to moisten the crumbs. Place 1/4 cup of chocolate cookie crumbs into each of the tart pans. Press crumbs firmly into the sides and base of the tart pans. Bake for 15 minutes, until crusts are set. Allow to cool completely before using. 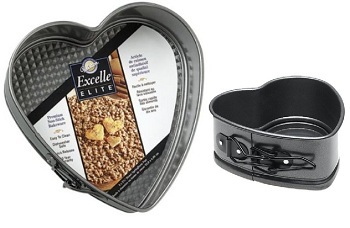 Make the ganache filling: Pour cream into a small saucepan (or a medium sized, microwave-safe bowl). Scrape the seeds out of the vanilla bean and put them in the cream. Bring cream almost to a boil over medium heat. Place chopped white chocolate in a large bowl and pour cream over the top. Allow to sit for 1-2 minutes, then stir with a whisk until mixture is smooth and all of the chocolate has melted. If small chunks of chocolate remain even after stirring for a few minutes, heat the ganache in the microwave for 5-10 seconds to warm it up a little. Pour ganache into cooled tart shells and allow to set at room temperature for several hours before serving. This looks amazing, so pretty! It’s so usual to see lighter crusts with chocolate filling…this way around is so striking! Looks so delicious. This looks very elegant, the perfect dessert for those special occasions! Can’t wait to give this recipe a shot. By chocolate cookies are you referring to the Nabisco Famous Chocolate Wafers? Or is this an Oreo crust? You can actually buy boxes of just the chocolate crumbs at many stores, too!